James Paul "Jimbo" Covert (born March 22, 1960) is a former American college and professional football player who was an offensive tackle in the National Football League (NFL) for eight seasons during the 1980s and early 1990s. Covert played college football for the University of Pittsburgh, and was recognized as an All-American. He was selected in the first round of the 1983 NFL Draft, and played professionally for the NFL's Chicago Bears. He is the president and chief executive officer of The Institute for Transfusion Medicine. Coached by legendary offensive line coach Joe Moore, the 1980 Panthers offensive line featured Covert at left tackle; Rob Fada and Paul Dunn sharing the left guard duties; Russ Grimm at center; Emil Boures at right guard; and Mark May at right tackle. The Panthers finished the 1980 season with a record of 10-1 and ended the season with a Gator Bowl victory over South Carolina. The 1980 team also featured four future College Football Hall of Fame inductees—Covert, Dan Marino, Hugh Green, and May—as well as a number of other players who eventually went on to play football professionally. The following year, 1981 Pitt Panthers finished 10-1 again and beat Georgia in a last-minute victory in the Sugar Bowl in New Orleans. The Panthers finished the season ranked number 2 in the AP and UPI Coaches polls in 1980 and ranked number 4 and 2 in the same polls respectively in 1981. 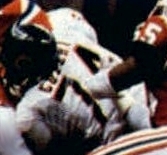 In 1986, Covert appeared in a 20-man battle royal at WrestleMania 2 along with other NFL stars. In May 2007, Covert was named President and Chief Executive Officer of The Institute for Transfusion Medicine, one of the nation’s foremost non-profit organizations specializing in transfusion medicine and related services, and the leader in transfusion medicine in both the Pittsburgh and Chicago regions. Its two blood centers, Central Blood Bank in Pittsburgh and LifeSource in Chicago, provide nearly a million units of lifesaving blood products annually. ITxM Diagnostics is a leading source of therapeutic and coagulation reference testing services while ITxM Clinical Services focuses on the pre-transfusion testing and delivery of vital blood products to patients. In 2018, Central Blood Bank and LifeSource were both renamed to Vitalant. ^ "Company Overview of The Institute for Transfusion Medicine, Executive Profile, James P. Covert". Bloomberg. Chief Executive Officer and President, The Institute for Transfusion Medicine Inc.
^ Alfano, Peter (March 27, 1983). "The Tug-of-war Between Athletics and Academics". The New York Times. pp. 1–2. Retrieved September 7, 2015. ^ "Pittsburgh's Jimbo Covert to Enter College Football Hall of Fame". University of Pittsburgh. March 24, 2003. Retrieved September 7, 2015. At Freedom High, Covert was a three-year letterman in both football and wrestling. In football, he was first team all-state and All-WPIAL. He pinned all but one of his wrestling opponents as a senior. ^ Rose Jr., Ed (October 29, 1977). "Injuries Keep Freedom from Celebrating". The Beaver County Times. Retrieved September 8, 2015 – via Google News. ^ "The best: Freedom's Covert on UPI All-State". The Beaver County Times. December 23, 1977. Retrieved September 8, 2015 – via Google News. ^ a b Zeise, Paul (March 25, 2003). "After All-American career, Covert named to College Hall of Fame". Pittsburgh Post-Gazette. Retrieved September 8, 2015. ^ Smizik, Bob (November 2, 2000). "1980 Panthers rank among best". Pittsburgh Post-Gazette. Retrieved September 8, 2015. ^ Barrickman, Bob (December 17, 1997). "Highlights Abound for Covert". Another Look. The Beaver County Times. Retrieved September 8, 2015 – via Google News. ^ "Past Rankings AP, UPI, USA Today, Harris: 1980–1989". College Football Poll. Archived from the original on June 3, 2009. Retrieved September 14, 2015. ^ "1982 Preseason AP Football Poll". College Poll Archive. Retrieved September 14, 2015. ^ "The 1983 Cotton Bowl Classic" (pdf). Cotton Bowl Classic. Retrieved September 14, 2015. ^ Jouzaitis, Carol (December 25, 1990). "Athletes get 2nd chance at a degree". Chicago Tribune. Retrieved September 10, 2015. ^ "1983 NFL Draft Round 1". National Football League. Retrieved September 8, 2015. ^ Carnicelli, Joe (December 19, 1983). "Dickerson, Warner, Marino head All-Rookie team". UPI. Retrieved September 18, 2015. ^ "1982 NFL Standings, Team & Offensive Statistics: Team Offense". Pro Football Reference. Sports Reference. Retrieved September 14, 2015. ^ "1985 NFL Standings, Team & Offensive Statistics: Team Offense". Pro Football Reference. Sports Reference. Retrieved September 14, 2015. ^ "1982 NFL Standings, Team & Offensive Statistics: Rushing Offense". Pro Football Reference. Sports Reference. Retrieved September 14, 2015. ^ "1988 NFL Standings, Team & Offensive Statistics: Rushing Offense". Pro Football Reference. Sports Reference. Retrieved September 14, 2015. ^ Wesley, Tim (September 30, 1984). "Jim Covert leads by example". The Beaver County Times. Retrieved September 14, 2015 – via Google News. ^ "1980s All-Decade Team". National Football League. Retrieved September 8, 2015. ^ a b c O'Donnell, Jim (January 16, 1994). "Jim Covert Still Standing Tall: His Football Career Ended Prematurely By Injury, The Ex-bear Star Is Tackling New Challenges These Days". Chicago Tribune. Retrieved September 8, 2015. ^ "Full WrestleMania 2 results". ^ "Hall of Fame class of 1996: Jim Covert Football ∙ Conway". Beaver County Sports Hall of Fame. Retrieved September 8, 2015. ^ Bires, Mike (March 25, 2003). "Covert Selected to Join College Football Hall". The Beaver County Times. Retrieved September 7, 2015. ^ "Jim Covert". National Italian American Sports Hall of Fame. November 8, 2012. Retrieved September 7, 2015. ^ "All-Time Pitt Great Jim Covert enters WPIAL Hall of Fame: Before his Pitt and NFL career, Covert starred at Freedom High in the WPIAL". University of Pittsburgh. May 6, 2009. Retrieved September 7, 2015. ^ "2012 Inductees: Covert, 'Jimbo' James P." Pennsylvania Sports Hall of Fame. May 14, 2015. Retrieved September 7, 2015. "2014 Modern-Era nominees". Pro Football Hall of Fame. September 12, 2013. Archived from the original on September 24, 2015. Retrieved September 7, 2015. Beaver County is a county in the U.S. state of Pennsylvania. As of the 2010 census, the population was 170,539. Its county seat is Beaver. The county was created on March 12, 1800, from parts of Allegheny and Washington Counties. It took its name from the Beaver River.Beaver County is part of the Pittsburgh, PA Metropolitan Statistical Area. Mark Steven Bortz (born February 12, 1961) is a former offensive guard in the National Football League. He attended the University of Iowa and was drafted by the Chicago Bears in 1983. The Wrays, also known as The Wray Brothers Band, were an American country music group from Oregon composed of Bubba Wray, Jim Covert, Lynn Phillips and Joe Dale Cleghorn. Following two independent singles, The Wrays released a pair of singles on Mercury Records in the 1980s. Their highest charting single, "You Lay a Lotta Love on Me," reached the Top 50 on the Billboard Hot Country Singles chart in 1987. After The Wrays broke up, lead singer Bubba Wray launched a successful solo career as Collin Raye. The Walter Camp “Alumni of the Year” award is bestowed by the Walter Camp Football Foundation on a worthy individual who has distinguished himself in the pursuit of excellence as an athlete, in his personal career and in doing good works for others. He must be an individual who has exhibited dedication and good moral conduct in achieving success. He must be a compassionate and unselfish person who contributes his time and assistance in helping to encourage and comfort fellow human beings less talented and less fortunate than himself. He must be an individual who takes pride in having been a Walter Camp All-American.